Chasing Eveline is the story of a 16 year old girl named Ivy, one day her mother got up and just left her, leaving her to be raised by her father even though he himself is dealing with the loss and abandonment. 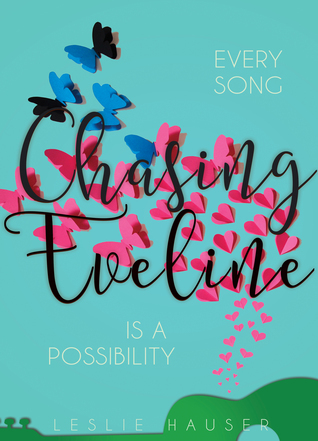 Ivy has only 1 connection with her mom and that is through her mom's favourite band from the 80s called Chasing Eveline. All of the songs take her to a place with her mother where the memories are fresh and they are happy. Together with her friend Matt who himself is struggling with a break up, try to get Chasing Eveline back together and they try to get the band new love from teenagers in creative ways and it made my heart melt how determined they both are in these activities because it was just that important to them. In the end they meet a boy named Sean who they quickly become friends with due to his love for the band too. Up to this point as a reader you really don't know which way this book is going and let me tell you there's plot twists in there. The best part of this entire book to me was that it was a realistic story told about a teen girl dealing with pain and grief. She was strong in her broken heartedness. She was strong and determined and so real. The ending of the book was perfect, I mean they struggle hard throughout so any sort of reward at the end was going to be worth it but the end was such a great reward for them. Its a story of friendship and love, family and acknowledgment and acceptance. Just pure brilliance. I feel as though this is YA novel that anyone can read no matter their age. Its heart warming and heart breaking, food for the soul, sewn together with love and written so perfectly. I cried and laughed, I experienced emotions with these characters and their lives, a great book does this and Leslie has done an amazing job here. For all of this alone it is a 5/5 from me and a recommendation to anyone, I believe there is so much more for me to say but I can't quite put it into perfect enough words to express it. I really hope that I can read more of Leslies work in the future because Chasing Eveline with stay with me.